Please include attribution to TheTruckersReport.com with this graphic. The legal weight for an eighteen wheeler is 80,000 lbs. [40 tons]. [ 36287 kg Canadian] That is without any oversize or overweight permits. In comparison, the average automobile weighs over somewhere around 5,000 lbs. The average length of an eighteen wheeler varies greatly depending on the type of cab they are driving. But the overall average is 70-80 ft. long. The length of an eighteen wheeler’s cab [by wheelbase] usually averages between 245″ to 265″ wheelbase. This is measured from the center of the rear wheel to the center of the steer. The length of time to stop an eighteen wheeler is 40% greater than that of an automobile. Depending on the weight of their load, whether they are bobtailing, road conditions, and other factors. To be sure, it takes a much greater time to stop than an automobile… period. Trucks only have 10 brakes NOT eighteen as some have told me they thought. Trucks made now are required to have anti-lock brakes. What is the turning radius of eighteen wheelers? Click HERE for more information on the turning radius of eighteen wheelers. What does an eighteen wheeler cost? While there are myriad variables on the costs, the CAB of an eighteen wheeler usually ranges from $130,000 to $180,000 new. New trailers usually range from $30,000 to $80,00. So all in all you could be paying over a quarter-million dollars for a new truck and trailer. What is the “fifth wheel” ? 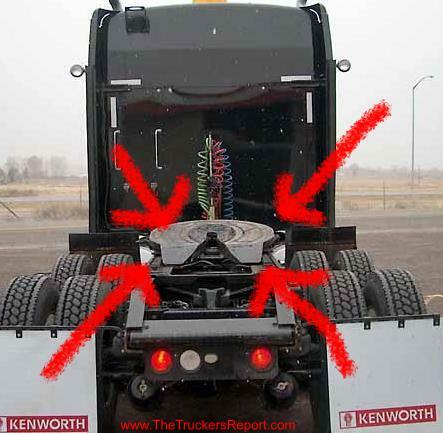 The fifth wheel on an 18 wheeler is a round plate above the drive tires that couples [hooks together] the trailer to the truck. How many gears does an 18 wheeler have? The most common amount of gears in an 18 wheeler today is 10 forward and 2 reverse gears. Although they can range from 9, 10, 13, 15, and 18 gears! Eighteen wheeler drivers use a “double-clutch” technique for shifting. It is much different to drive a truck compared to a car with a standard transmission. In a car the rpm’s match up and in a truck they do not therefore the clutch is depressed and then depressed again to “match” the gears with the rpm’s. Most drivers use what they call “floating” which does NOT use the clutch at all except to start and stop. “Floating” is an acquired skill that takes some practice to get used to. “Floating” gears saves fuel (when done properly) and saves wear and tear on the equipment. “Floating” is the preferred method. Bobtailing is the term used when a truck is driving WITHOUT the trailer attached. This is very dangerous especially in wet weather but obviously must be done at times. What is the standard height of an eighteen wheeler? What Is A Tandem ? 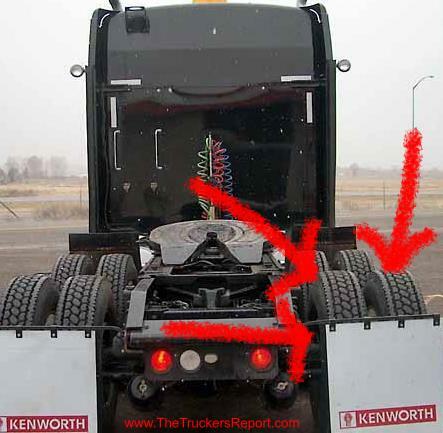 Tandem sometimes incorrectly refers to a set of TWO tires (Pictured) on a tractor-trailer. However, these are more commonly known as double wheels, dual tires, or ‘dualies.’ They are used for safety (redundancy) so if one tire blows the others will continue to hold up until the tire is repaired. The correct definition of Tandem is a set of two axles, with one axle immediately following the other. By distributing the load over two axles, each axle bears less weight. Because there are laws limiting the amount of weight that can be carried on each axle, distributing the weight over more axles allows a greater total amount of weight to be carried. Basically, a jack-knife accident is when the trailer contacts the tractor by the trailer “coming around” on the driver. It is said that once a trailer exceeds a 45 degree angle, compared to the tractor, that a jack-knife is inevitable. This can be caused my many things and happens when the trailer wheels start to skid and actually ends up moving faster than the cab. Usually this happens on icy or wet roads but it can happen on dry roads when the trailer is empty and the driver has to do some very hard braking. 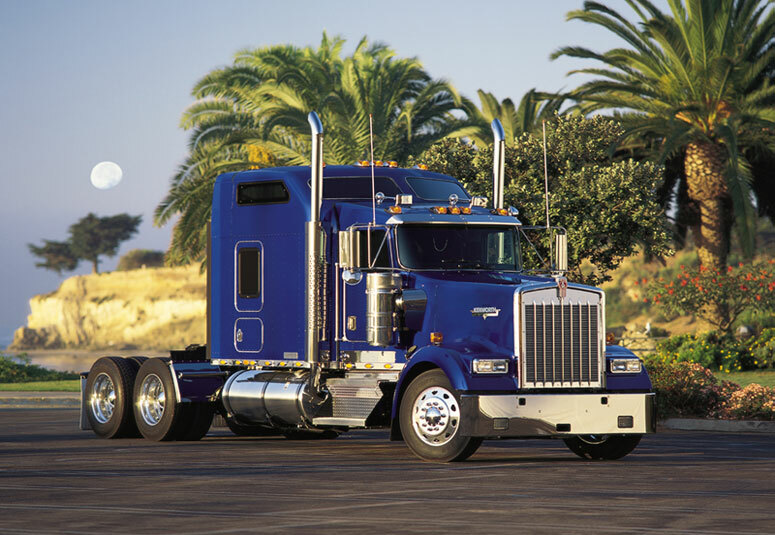 There are a variety of brand names for eighteen wheelers; among them are: Peterbilt, Freightliner, Kenworth, Volvo, Mack, Western Star, to name a few more popular trucks. How Many Axles Does An Eighteen Wheeler Have? An eighteen wheeler has a total of five (5) axles. 52 comments. Add a comment. A sudden stop or an emergency would require very fast responses, brake hard and steady and use the anti-lock to steer around your problem, or stab break and stop in a straight line. The engine brake and downshifting require too much time. these methods are designed for controlled breaking down hill, or a planned slow down like an exit ramp. Hi Dan I really find all your information of great interest because I am planning to start training to get my CDL license so I will just go over these until I can get more information, thank you. it depends on what pin hole your trailer tandems are in and where your fifth wheel is. you have too many variables, better to just scale every time. If there are only 2 pallets of beef in the trailer (4000#) it doesn’t matter where the pallets are placed in the trailer. However if the pallets of beef were in the middle of the trailer , the truck would ride smooth ! Samuel – You made an error in your drawing on what “wheelbase” is, and the distance is wrong also. Wheelbase is not the width of a truck, from outside of tire to outside of tire, that is the “track”. Wheelbase is “always” measured from a front axle/wheel to a rear axle/wheel, not from side-to-side. Wheelbase of a tractor/truck (measured between rotational centers of wheels or axles) is measured from the front axle/wheel of the tractor/truck to the rear axle of the tractor/truck. The overall wheelbase of a tractor-trailer will be measured from the front axle/wheel of the tractor to the rear axle/wheel of the trailer. Above you show a wheelbase at 245″ – 265″, that is 20′- 5″ to 22′-1″, only the enormous CAT and EUCLID off-road trucks are that wide. Actually, wheel base is measured from center of front axle to center of rear axle group. if you have tandems at the rear, you would measure to the center of the tandems, if you have three axles at the rear of the tractor, wheel base would be measured to the center axle. if you have only one axle at the rear, wheel base would be measured to the center of that rear axle. if you have a lift axle and two drive axles, the wheel base would change as you raise and lower the lift axle. Wheelbase= inches from center of steer axle to center of rear most axle. There are one set of rules that are set by the US Federal government and they say that for highways that are federally funded (interstates and some other bigger roads) the minimum weight that states HAVE TO allow is 80,000 lbs. States cannot set the limit on interstates lower than 80,000 lbs, but they can set lower limits on state highways. However, there is a catch.. if a state had a higher weight limit in place before this federal law was passed (Surface Transportation Assistance Act of 1982 (STAA)) the state can still allow trucks heavier than the 80,000 lbs limit. The state with the highest weight limits by far is Michigan. The highest grossing truck without a permit in Michigan can top out at 151,400 lbs! With 8 axles on the trailer! Without a permit! Usually these trucks carry loads of raw steel between steel mills and factories. In Canada, most of the country allows much higher weights than in the US (but not as high as Michigan). Each province sets their own weight limits independently. A typical combination in Canada is a tandem drive tractor with a tri-axle trailer. This is like the typical 18 wheeler with an extra axle on the trailer (22 tires). Weights vary across the country but they are usually around 110,000 lbs. The second usual combination that is used across Canada is the B-Train. It is a tandem drive tractor pulling a trailer with three axles, and attached to this trailer is a second trailer with two axles. Across Canada, the B-Train weight limit is 139,700 lbs (63,500 kgs). B-trains actually have 2 axles (tandem in the center. The combination you are referring to is actually a Super-B train. I see lots of seni trailers with skirting under the trailer, what does the skirting do? They cut down on wind resistance, improving the aerodynamics and fuel efficiency of the eighteen wheeler. Trailer skirts can increase MPG by a few percentage points, which saves thousands of dollar per year in fuel costs. Early versions were rigid and prone to breaking when hit by debris on the highway at 65mph. I’ve heard that some newer versions have flexibility built in and are able to withstand the daily abuse. Can I get the overall length of a typical U.S. Wal-Mart semi tractor trailer? There’s would no indication of any sleeper accommodation to the tractor, so I am guessing this would be closer to 70 than 80 feet. Linda,,, The overall length of a Wal-Mart trailer, from back door to the nose, is 53ft. and the length of the truck at the point of trailer nose to the front of truck is about 11 to 12 feet and this is a sleeper truck. So the overall length of your average Wal-Mart truck is 64-65 feet long and also the legal width of any truck is 8 to 8.5 feet, anything over that wide requires an oversize permit. My guess is most combinations are 2-4,000 lbs lighter. My tractor is heavier than most, not all. If I remember right my tractor, alone, is around 22,500 with full tanks of fuel. Trucks weigh 31,000 lbs. +/- with empty 53′ trailer. they max out at 80,000 Lbs., But can carry more with more axles and permits. Recently, as I was driving for 3 hours on Interstate 5 in Northern California, I logged the manufacturer of every semi truck I passed. Is this an approximately fair representation of market share? Would it be noticeably different, say, on the east coast? People sometimes say “built like a Mack truck!” – what happened to that brand? Mack is known for dump trucks, not semis. There is a reason you only saw 2. Buy a Freightliner. There is a reason you saw 40. I drove for UPS, I drove a Mack for years, and loved it! Our Volvo holds a total amount of 247 gallons of fuel, 123 gallons with some change per tank but hubby and I run a 2016 Volvo 730 ( has sleeper berth ) not a smaller day cab. Were OTR long haul Drivers. I think Mack and Volvo merged. I guess my truck is a little heavy then. Fully fueled, with a 53′ dry van, I weigh 36000. The wheelbase is 300″. I hold 270 gallons of fuel and get between 4 to 5.5 mpg depending on what part of the country I’m strolling. I’m a car Hauler and I have heard that car haulers are allowed to be over 13,6 height. Is this correct? And if so what is the heighth? What is the average hight of main freeway’s and highway’s bridges, overpasses, and tunnels? Is it different in Canada? Most truckers I have met over the years are intelligent, polite and helpful, where does this community stand on violations of small town bylaws regarding the garaging, parking and operations of their semi’s in a residential neighborhood where they also reside? One neighbor is a trucker and does give a hoot about fumes, idals his truck for over the law’s amount of time. Pulls out with high beam head lights on waking neighbors at 4 or 5 AM. I respect your profession an feel people like him are not suitable to be a professional truck driver. May want to look at article on legal Canadian axle weights. Legal tandem weight in Canada is 17000kgs. What is the maximum legal weightload of 18 Wheeler truck with 2 axle & 3 axle in US and Canada? How much does a semi-truck tire weigh? Can you tell me how long it takes for a 70-80 semi to go from a complete stop to moving (like @ a stop light). That totally depends on the weight of the unit, the power of the engine, and the driver. \generally though, much longer than a car. Does anyone know the percentage of solo women drivers today? When I ran all 48 and Canada back in the 1980’s, a safety director told me that only nine percent of drivers were women and, of that nine, only three percent ran solo. I was one of the three percent. Back then, 53-foot trailers were not allowed on the dirty side except on the interstates. I pulled a few in my day, mostly out west, but now they’re standard. There were no computers, no cell phones, no automatic transmissions, and company drivers did NOT have jake brakes. You either knew how to handle a truck or you didn’t. Things have really changed! It takes a special license (CDL), and special skills to operate an 18 wheeler, skills learned over time. You can’t just hop in an 18 wheeler and expect to know what you are doing. It takes a special kind of person to drive an 18 wheeler. Air brakes. I hope nothing breaks. If you have a apu installed you are allowed 800 pounds over or 80800 gross. That is the weight of the apu. One thing I have noticed this winter if you get uncomfortable while driving with the weather or actions of traffic park it. Your dispatcher and company may try to get you to continue but the choice is yours. Welcome to Semi-Truck Inventory international network for used trucks. We have an international network that provides you with a unique and large pool of new and used commercial trucks of all brands, ages, and types. We are a company driven by values and this makes us deliver innovative transportation and logistics solutions that are important to the companies and people we serve. Our services are tailored to help you meet your goals. We know each of our trucks from our stock and we have checked its condition and we have calculated it fair value. As a Semi-truck inventory customer, you can be guaranteed of getting the best new and used commercial trucks.